Sometimes I get these ideas the day before I have to teach a class. They always seem like great ideas. Awesome ideas, and the fact that I’m trying to put it together last minute for a class that I’ve pretty much had canned for the last few years doesn’t seem to dawn on me until right before I teach the class and I’m like “This might not work after all. Why did I think this was going to work? I should just do what I’ve always done, they’re all going to look at me funny when I tell them to do this, I should of worn flats, I’m going to trip in these heel boots” and every other insecurity hits me like a ton of bricks. This happened yesterday. I completely changed my approach to teaching database and keyword strategy. It was for an Intro to College class so all the students are new to college libraries and resources. It was an hour and half long class so I figured I had enough time to bumble through some of the awkwardness and find my footing. I did the same lesson again today for an ENG 101 that was only an hour long. In both cases, the class will be returning for a second session. My idea was to use this first session to focus on the mechanics of searching databases. I have always spent a few minutes at the beginning of the class explaining what a database is, how they work, how they can differ, and when there’s time I have them following along with doing a search in Google and then do another one in our discovery tool so they can see the difference. The idea is to always start with something they’re familiar with, then move on to something that’s new and unfamiliar. I decided to expand on that a bit this time by designing an anticipatory set that would allow students more hands-on time to explore several familiar tools like Google, Amazon and NPR.org and our databases, using a question sheet to reflect on the process as they go. I first start by explaining the very basics of what a database is and instead of just talking about it, I’m actually reaching outside of my comfort zone and drawing stuff on the white board. Then they do the anticipatory set. They have to search all different tools using the keyword “santuary cities” and then answer the questions: How many results are there? What type of information/sources do you get in the results? Does it provide lots of filters or just a few? 1) Google has lots of different kinds of information in their results, website, videos, news, .coms, .orgs, etc. 2) Amazon does give you books but you can’t read the books without paying for them. So Amazon isn’t so much a database of information as it is a database of records for stuff that has inforemation that you have to purchase first. This is where I can highlight how our library databases do have books, but they are books they can access and read for free. 3) NPR.org is full of news. It differs from Google in that it’s primarily all news related material. This introduces the concept of a database that focuses on a specific discipline or source type. 4) Search Almost Everything (our discovery tool) is kind of like Google but the information provided in the results are more appropriate for college research. It also has records for stuff like Amazon but you can access the full text, unlike Amazon. 5) The religion and philosophy database is more like NPR.org because it focuses on a specific discipline. There are also less filters offered in comparison to Search Almost Everything. The rest of the lesson focuses on keyword strategy and develop a research question. I’m still not sure yet if I’m going to keep this as a standard lesson. This anticipatory set does take about fifteen minutes total once you include the discussion time afterwards, so it definitely works best when you have more than one session with the class and longer class period. This entry was posted in Uncategorized on February 6, 2019 by chuxley. According to the blogging schedule I’m trying to keep to, I’m supposed to be writing about my reflections on teaching a college success course today. However, we’re currently having a snowpocoloypse up here and we’re shutting down the library early. So, I decided to share this funny skit of the Two Ronnies I saw on the ALA ThinkTank page this morning. I used to live in Scotland when I was little so I often watched The Two Ronnies with my parents. Of course, I never could understand what everyone was laughing about at that age but now, this library skit is definitly a favorite. This entry was posted in Uncategorized on January 30, 2019 by chuxley. This entry was posted in Uncategorized on January 15, 2019 by chuxley. Someone had shared a post from the blog shortly after the 2016 election and I can remember my first thought was “thank goodness, someone is finally explaining science to the rest of us.” However, I’ve always been a bit bothered by the fact that the blogger writes anonymously. There are so many useful articles, providing some great content and inspiration for information literacy instruction (ex. Does Splenda cause cancer? A lesson in how to critically read scientific papers) but I’ve hesitated to use any of it because there’s no verfiably information about the author. So I started thinking, what if that’s the lesson. Wouldn’t this be a great class discussion starter? In their about page, the author indicates that they are posting anonymously because they’re concerned about being harrassed or trolled, which is a very legitimate concern. We’ve all seen it, there is very little restraint online these days when it comes to verbally attacking those with which we disagree with and in this blogger’s case, it appears as though their attackers are following them around the internet just seardching for an opportunity to unleash their venom. But the question to pose to the class, I think, would be whether they should use or how should they use the information provided in the blog posts. Should they quote the author? If so, how do they quote an anonymous blog? The content they link out to in order to support their arguments are in many cases scholarly, academic sources. But is that enough when we still don’t know who they are? Perhaps there should be some flexibility when it comes to anonymity especially if the blogger seems threatened. After all, Oxford University recently announced the release of their new Journal of Controverisal Ideas that promises that very thing, to allow scholars to publish anonymously if they feel their article might threaten their position. Maybe there are arguments out there that we are afraid to have that we will only have if we don’t know who eachother are? Does this help scholarsip? Or weaken it? This entry was posted in lesson idea, teaching on January 8, 2019 by chuxley. We’ve spent the better part of the last three years revamping our information literacy program. It was partly motivated by the change to the ACRL Framework but also by our own awareness that the current methods we were using to teach and assess infolit needed a little bit of refreshing. We are challenged by many of the same issues other community colleges are. We don’t have any credit bearing courses and any attempt to add any have never been successful. As a result, we rely on the one-shot or if we’re lucky and the faculty member sees the benefit, the two-shot. To get the initiative in motion, my collegues suggested we start meeting on a weekly basis to brainstorm ideas and ultimately, get a handle on this new Framework thing. Although we all agreed that the current ACRL Standards needed a serious overhaul, we weren’t exactly sure how the new Framework was going to make any of that better. Although Assessment is the third on the list, it was clear that it needed to be the first priority we worked on. Our campus was already moving more towards the idea of focusing assessment on local standards so we decided to come up with our own for information literacy. This was new territory for us since we always relied on the ACRL standards in the past. This is when we finally figured out how the Framework could work for us. Although we went through several different drafts, we finalized a version last spring, just in time for our end of the year assessment. We decided to create a broad set of student learning competencies first which fell neatly into five different categories: Access, Inquiry, Search, Evaluation and Attribution. Then, within each catagory we created specific student learning outcomes. 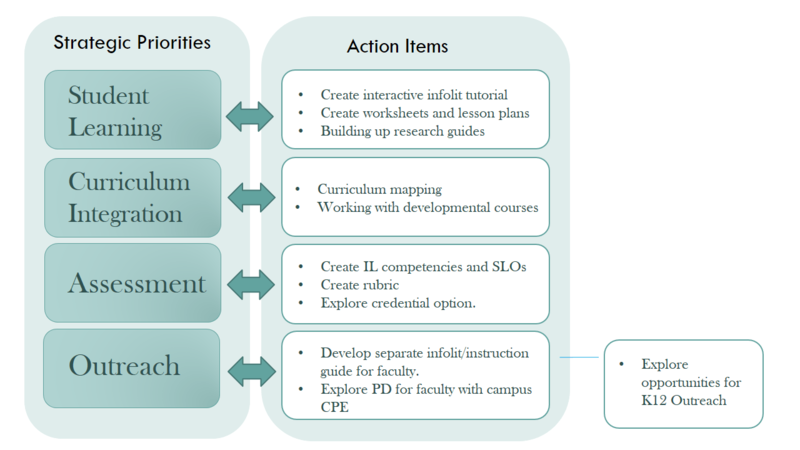 Our idea, or our hope, was that this format would actually allow some flexibility for faculty who could either utilize the student learning outcomes we had develop, or create a set of their own discipline specific outcomes within each category. This was our solution to the “How do we integrate information literacy into the curriculum?” problem. I did a brief presentation on this for ACRL last spring which you can view below. I don’t start until fifteen minutes in but I highly recommend you watch the whole showcase. There were some super spectacular ideas shared by the other presenters. This entry was posted in information literacy initiative and tagged acrlframework on December 6, 2017 by chuxley. I’ve recently started using Padlet in my one-shots as a way for students to collaboratively brainstorm keyword combinations. Since all the students have their own desktop or laptop to work from, they can all contribute to the Padlet and see what everyone else is adding at the same time. I like using it as a tool. 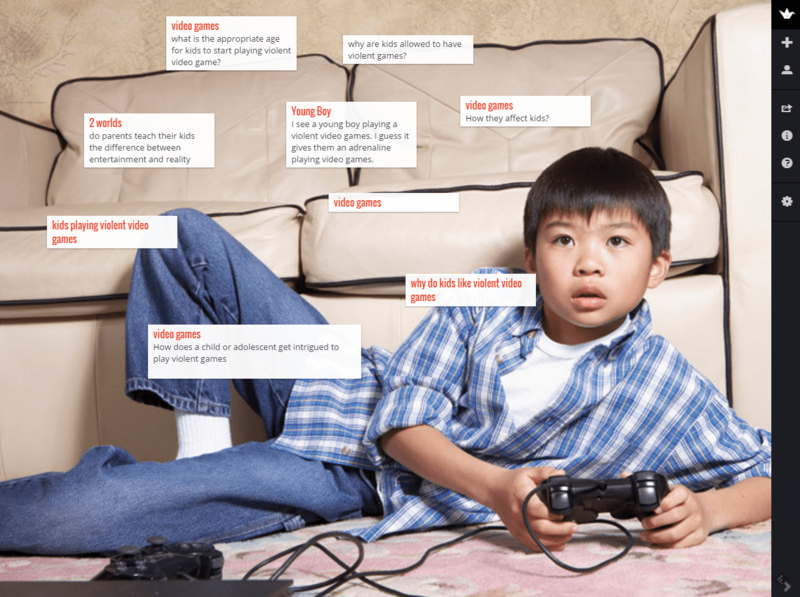 The students are often a little apprehensive at first but once they double click on the Padlet and see how easy it is to add a note the activity continues to go quite well. I’ve used a white board for this activity in the past but it was often hard to get students to speak-up with any suggestions. I imagine this is a common issue in one-shots. Students may be comfortable contributing to discussion in their own classroom, but once there in the library with me they’re in a new place with a new face for an instructor. It can be hard to break through that first time meeting awkwardness. I normally wouldn’t get more than one or two students to raise their hand and suggest something. The Padlet seems to alleviate that somewhat. Those students who are anxious about speaking in front of everyone can add a note to Padlet anonymously. As a result, I would get far more keyword suggestions than I would when using the whiteboard. This entry was posted in teaching and tagged information literacy, keywords, library instruction, padlet on January 29, 2016 by chuxley. Hi there, my name is Carleen and I’m an academic librarian specializing in information literacy instruction, student learning assessment, and open educational resources. Share book reviews and ratings with Carleen, and even join a book club on Goodreads.